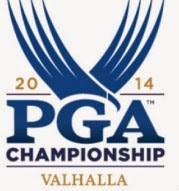 THE 2014 PGA CHAMPIONSHIP TEES OFF on Thursday at Valhalla Golf Club in Louisville, Kentucky. The field of 156 players includes 136 tour pros and 20 PGA club pros. The current weather forecast for the year's last major looks good, with temperatures in the mid 80s, a 20 to 30 percent chance of rain (each day) and light winds. TV coverage of the 2014 PGA Championship is on TNT and CBS.